Um, hello, is this the police station? Why yes, ma’am. Yes it is. What seems to be the trouble? Well, no trouble. No trouble at all, really. Though I am alarmed. Well, I can send an officer out your way if you want to make a statement. Can you explain why you’re alarmed? There’s this banana plant. In my kitchen. It’s… it’s getting pretty big. Alarmingly big. I’m frightened. Have you seen Jumanji? Uh, ma’am. Did you say banana plant? Yes. Banana plant. I have one, and it’s taking over. My kitchen, that is. It gets a new leaf each week. The water from its leaves dripped on the tile and ate the finish off in spots. [whispers] I think it’s trying to kill us. (Long pause) Ma’am, have you been taking drugs? Now, sir, really. I’m afraid for my life, and you’re asking about my personal habits? 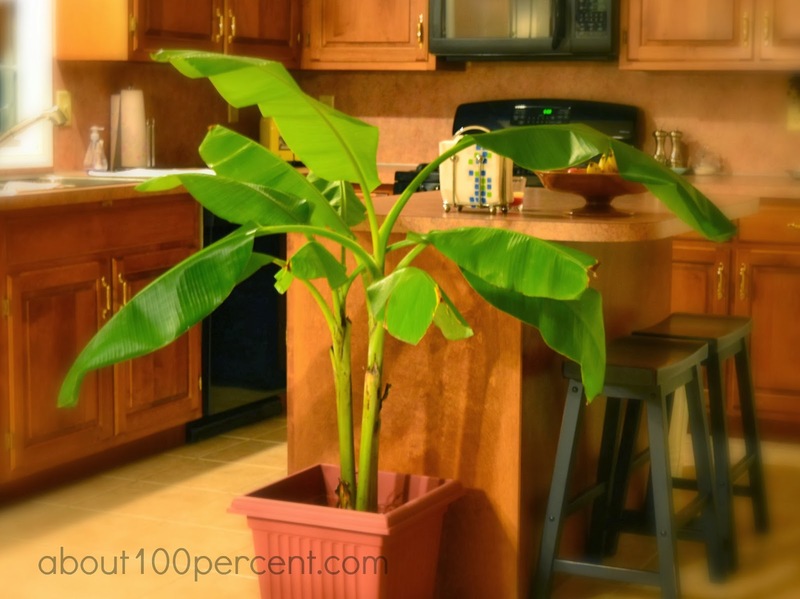 Ma’am, we don’t act on calls regarding distress about a banana plant growing too large for a kitchen. Our people have work to do. If you keep this up we will flag your number for false alarms. Is that what you want? No, I do not. I’m still alarmed, though. Then put the plant in another room. Or take it outside. Then it will be out of your way. But, sir! It is a tropical plant. It will die in the cold. I brought it in so it would survive the winter. In the summer we plant it in the yard and it is glorious. Then I don’t know what to tell you. Summer is only a few months away. You’ll just have to hang on until then. Yes. Yes, I guess you’re right. Thank you, sir. You’re welcome, ma’am. In the meantime, please keep in mind that the police line is for emergencies only. Not for complaints about rogue houseplants. (chuckling) Okay. I’ll keep that in mind. Goodbye. we have a few of those-but we keep ours outside ; ) stay warm! If mine get as big as yours I'm leaving. Oh hell, that is a big plant! It really is. And it's getting bigger. I vote you hang some decorations on it and call it a statement piece. Huh. Now there's a thought. The acid-water it spews would ruin them, though. Ah, yes...winter. It's officially boring into our brains...and trying to kill us- one way or another!! Stay strong my friend!! That is a very big plant. Also, I think it's side-eyeing you. I would worry. I think it's developing a mind of its own. If it starts growing bananas I'm out of here. That is pretty much the best idea I've heard all day. What excellent customer service your local police department has! Only a couple more months before your rogue houseplant can go back outside where it will take over the world! The way it multiplies, it could take over the world. Luckily for us, it has to come in for the winter, where its plans are foiled by limited root space. Billions of people don't know that I am saving their lives every day. Ohmyggodness, you! I'm so glad you're being so... careful with that one! Hahahaa love this! May it bless you with lots of yummy bananas! I don't know that it would ever grow bananas since its growing season is interrupted so regularly. I don't even know if it has the capacity to grow them. But if it does we're all in trouble, I think. Love that plant! Also: SNORT - you are seriously funny (<-- see what I did there? ).